Here is the most telling fact: you wish to possess me. Here is another fact: I loved you and let you think you could. When Irene America discovers that her husband, Gil, has been reading her diary, she begins a secret Blue Notebook, stashed securely in a safe-deposit box. There she records the truth about her life and her marriage, while turning her Red Diary--hidden where Gil will find it--into a manipulative farce. Alternating between these two records, complemented by unflinching third-person narration, Shadow Tag is an eerily gripping read. When the novel opens, Irene is resuming work on her doctoral thesis about George Catlin, the nineteenth-century painter whose Native American subjects often regarded his portraits with suspicious wonder. Gil, who gained notoriety as an artist through his emotionally revealing portraits of his wife--work that is adoring, sensual, and humiliating, even shocking--realizes that his fear of losing Irene may force him to create the defining work of his career. Meanwhile, Irene and Gil fight to keep up appearances for their three children: fourteen-year-old genius Florian, who escapes his family's unraveling with joints and a stolen bottle of wine; Riel, their only daughter, an eleven-year-old feverishly planning to preserve her family, no matter what disaster strikes; and sweet kindergartener Stoney, who was born, his parents come to realize, at the beginning of the end. As her home increasingly becomes a place of violence and secrets, and she drifts into alcoholism, Irene moves to end her marriage. But her attachment to Gil is filled with shadowy need and delicious ironies. 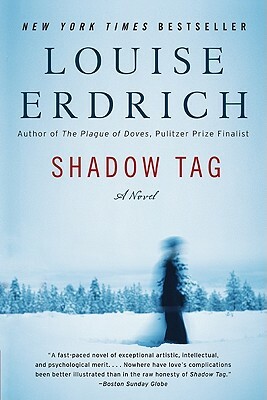 In brilliantly controlled prose, Shadow Tag fearlessly explores the complex nature of love, the fluid boundaries of identity, and one family's struggle for survival and redemption.